Karavaiev's (1931d) description is at . Bolton's note, which has no description, (1980) is at . Bolton's (1980) diagnosis, extracted from his key, is at . WORKER - TL 2.5 mm. Type collection from Naivasha, by Dogiel & Sokolov. 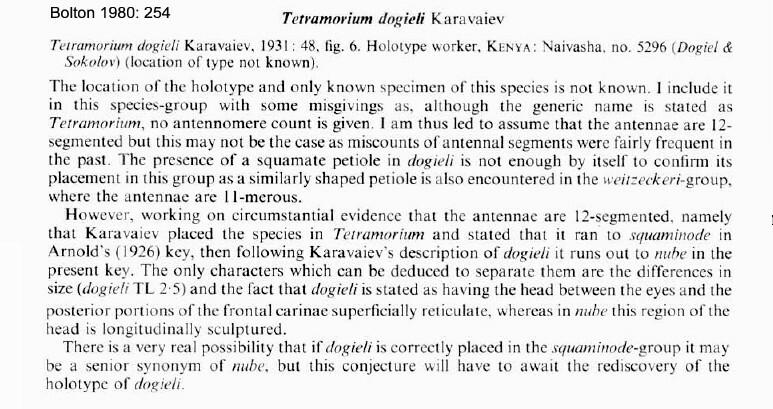 Karavaiev's description draws similarities with Tetramorium squaminode. 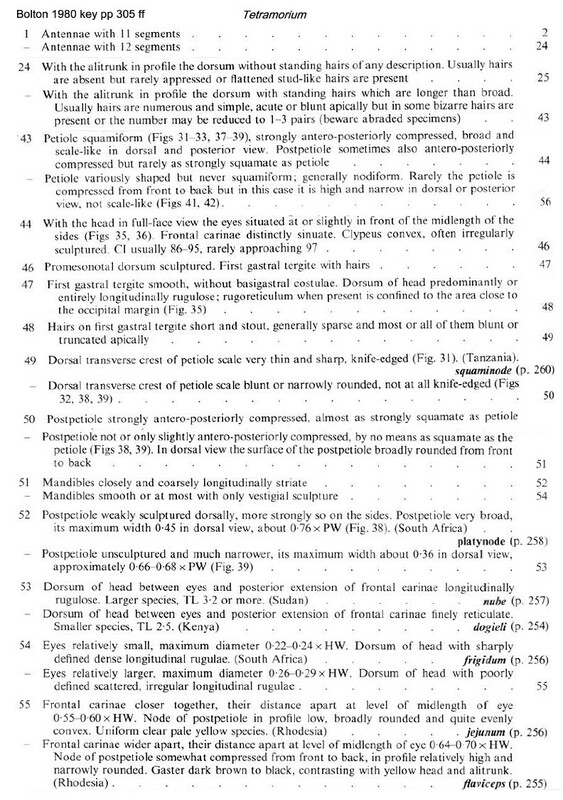 The Bolton key separation (couplet 51) has "mandibles closely and coarsely longitudinally striate" but Karavaiev has "Mandiblen fein l鋘gsgestricheit", i.e. fine longitudinal striation. 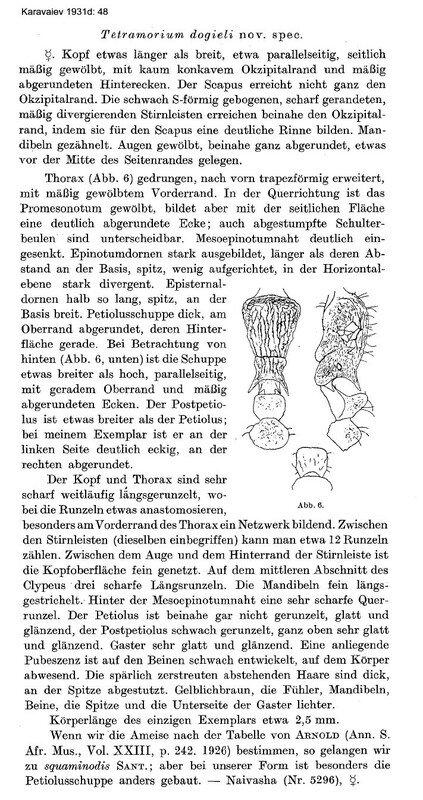 He also noted the colour as yellowish brown with the antenna, mandibles, legs, spines and underside of the gaster lighter.Karavaiev also has the petiole and postpetiole as "glatt und gl鋘zend", i.e. smooth and shiny. which appears to contradict the weak patterns on his drawing. The photomontage is of two specimens collected from the Usambara Mts, Tanzania; Zigi Lodge, Amani NR; collector Vasily Grebennikov. Worker: TL ca 2.5 mm, HL 0.62, HW 0.5, CI = 0.81, SL 0.42, SI = 84, PW 0.42. 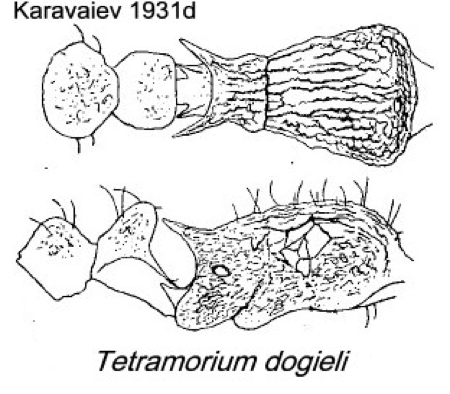 These specimens appear to match Karavaiev's description and drawings, although the petiole node is more nodiform than it is squamiform. With more lateral illumination, however, the petiole does appear angular. The weak patterning on the petiole and postpetiole also can be seen. The mandibles are paler and almost smooth.